Sofa Bed Vs. Sofa Sleeper: What's the Difference? While the terms are often used interchangeably, there are many differences between a sofa bed and sofa sleeper. Typically, sofa beds, like futons, are designed to lay out flat to form a bed. They don't offer a traditional mattress. On the other hand, a sofa sleeper has a mattress hidden within its frame that can be unfolded for easy use. However, buyers should be wary when they hear these terms. Either sofa bed or sofa sleeper might be used to describe either type of couch. Because these beds also serve as seating, sleeping space is limited. Sofa beds offer just enough room for one person to stretch out and relax. 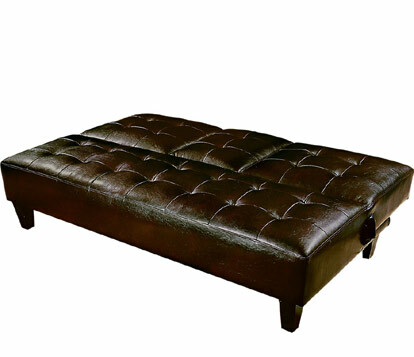 A sofa bed is an ideal choice for a small room or studio apartment. One piece of furniture can serve as both a couch and a bed, conserving space and money. One challenge that comes with this type of bed is finding the proper sheets. Sofa beds may come in twin size or non-standard measurements. One big difference between a sofa bed and sofa sleeper is size. Sofa sleepers can comfortably fit two people with plenty of room for personal space. Additionally, the pull-out mattress is designed specifically for sleep as opposed to a sofa bed whose cushions serve dual functions. As a result, sofa sleepers typically provide a more restful night's sleep for any long-term visitors. Sofa sleepers look exactly like traditional couches, with the added bonus of a fold-away mattress inside. Keep in mind that more space will be needed when these pieces are converted into a bed. New design advances also make it possible to manufacture sofa sleepers in loveseats and even chairs-and-a-half accommodating full and twin-sized beds. This offers greater versatility for tight spaces. Since most sofa sleepers come with a queen size mattress, buyers have more bedding options. Full sheet and comforter sets are more widely available than they are for sofa beds. Check out our related article: What to Look for in a Sleeper Sofa.